Torcetrapib (CP-529,414, Pfizer) was a drug being developed to treat hypercholesterolemia (elevated cholesterol levels) and prevent cardiovascular disease. Its development was halted in 2006 when phase III studies showed excessive all-cause mortality in the treatment group receiving a combination of atorvastatin (Lipitor) and torcetrapib. Torcetrapib has not been found to reduce either cardiovascular disease or risk of death in those already taking a statin drugs. Torcetrapib acts (as a CETP inhibitor) by inhibiting cholesterylester transfer protein (CETP), which normally transfers cholesterol from HDL cholesterol to very low density or low density lipoproteins (VLDL or LDL). Inhibition of this process results in higher HDL levels (the "good" cholesterol-containing particle) and reduces LDL levels (the "bad" cholesterol). The first step in the synthesis was a recently created reaction of amination to p-chlorotrifluoryltoluene, a reaction that was created by Dr. Stephen Buchwald at MIT. Development of the drug began around 1990; it was first administered in humans in 1999, and manufacturing at production scale began in Ireland in 2005. Pfizer had previously announced that torcetrapib would be sold in combination with Pfizer's statin, atorvastatin (Lipitor); however, following media and physician criticism, Pfizer had subsequently planned for torcetrapib to be sold independently of Lipitor. A 2004 trial (19 subjects, non-randomised) showed that torcetrapib could increase HDL and lower LDL with and without an added statin. Nine phase III studies were completed. On December 2, 2006 Pfizer cut off torcetrapib's phase III trial because of "an imbalance of mortality and cardiovascular events" associated with its use. This was a sudden and unexpected event and as late as November 30, 2006 Jeff Kindler, Pfizer’s chief executive, was quoted, "This will be one of the most important compounds of our generation." In the terminated trial, a 60% increase in deaths was observed among patients taking torcetrapib and atorvastatin versus taking atorvastatin alone. Pfizer recommended that all patients stop taking the drug immediately. Six studies were terminated early. One of the completed studies found it raised systolic blood pressure and concluded "Torcetrapib showed no clinical benefit in this or other studies, and will not be developed further." The drug cost $800m+ to bring into Phase III development. Dietary cholesterol needs be esterified in order to be absorbed from the gut. The enzyme, cholesterylester transfer protein (CETP), then completes the absorption of cholesterol. Drugs that interfere with the action of these peptides would aid in lowering cholesterol levels by complementing the action of the statins that inhibit the endogenous production of cholesterol. The CETP inhibitor torcetrapib (8) proved very effective in lowering cholesterol levels in humans; the drug not only lowered low-density lipoproteins (LDL and VLDL) but also raised levels of high density, “good” lipoproteins (HDL). This agent, which had only a brief time on the market due to adverse safety reports, is included here to illustrate an unusual method for preparing tetrahydroquinolines. 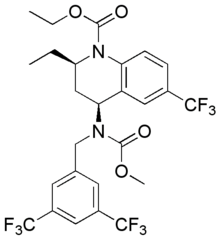 Reaction of the trifluoromethylaniline (1) with propanal in the presence of benzotriazole (2) affords the aminal (3). Condensation of (3) with the vinyl carbamate (4) yields the tetrahydroquinoline ring (5) with expulsion of the benzotriazole fragment. The ring nitrogen is then protected as its ethyl carbamate by acylation with ethyl chloroformate (6). The benzyl carbamate function on nitrogen at the 4 position is next removed by reduction with ammonium formate over palladium to afford the primary amine; this compound is then resolved as its dibenzyl tartrate salt to afford the 2R,4S isomer (7). Reductive amination with the bis-trifuoromethyl benzaldehyde in the presence of sodium triacetoxyborohydride followed by acylation with methyl chloroformate completes the synthesis of torcetrapib (8). Clark, RW; Sutfin TA; Ruggeri RB; Willauer AT; Sugarman ED; Magnus-Aryitey G; Cosgrove PG; Sand TM; Wester RT; Williams JA; Perlman ME; Bamberger MJ (January 22, 2004). "Raising high-density lipoprotein in humans through inhibition of cholesteryl ester transfer protein: an initial multidose study of torcetrapib". Arteriosclerosis, Thrombosis, and Vascular Biology. 24 (3): 490–497. doi:10.1161/01.ATV.0000118278.21719.17. PMID 14739125. Retrieved 2006-12-03. Clark, RW; Ruggeri RB; Cunningham D; Bamberger MJ (March 2006). "Description of the torcetrapib series of cholesteryl ester transfer protein inhibitors, including mechanism of action". Journal of Lipid Research. 47 (3): 537–552. doi:10.1194/jlr.M500349-JLR200. PMID 16326978. Retrieved 2006-12-03. Davidson, MH; McKenny JM; Shear CL; Revkin JH (November 7, 2006). "Efficacy and safety of torcetrapib, a novel cholesteryl ester transfer protein inhibitor, in individuals with below-average high-density lipoprotein cholesterol levels". Journal of the American College of Cardiology. 48 (9): 1774–1781. doi:10.1016/j.jacc.2006.06.067. PMID 17084249. Archived from the original on 2011-07-10. Retrieved 2006-12-03. McKenny, JM; Davidson MH; Shear CL; Revkin JH (November 7, 2006). "Efficacy and safety of torcetrapib, a novel cholesteryl ester transfer protein inhibitor, in individuals with below-average high-density lipoprotein cholesterol levels on a background of atorvastatin". Journal of the American College of Cardiology. 48 (9): 1782–1790. doi:10.1016/j.jacc.2006.06.066. PMID 17084250. Archived from the original on 2011-07-10. Retrieved 2006-12-03. ↑ Keene, D; Price, C; Shun-Shin, MJ; Francis, DP (Jul 18, 2014). "Effect on cardiovascular risk of high density lipoprotein targeted drug treatments niacin, fibrates, and CETP inhibitors: meta-analysis of randomised controlled trials including 117,411 patients". BMJ (Clinical research ed.). 349: g4379. doi:10.1136/bmj.g4379. PMC 4103514 . PMID 25038074. ↑ Buchwald, Stephen (July 23, 2004). "Research Projects". Archived from the original on 2007-10-25. Retrieved 2007-10-04. ↑ "Pfizer Begins Production at Torcetrapib/Atorvastatin Manufacturing Facility" (Press release). Pfizer. June 22, 2005. Archived from the original on 2006-12-05. Retrieved 2006-12-03. ↑ Berenson, Alex (July 26, 2006). "Heart Pill to Be Sold by Itself". Business. The New York Times. Retrieved 2006-12-03. ↑ Brousseau, ME; Schaefer EJ; Wolfe ML; Bloedon LT; Digenio AG; Clark RW; Mancuso JP; Rader DJ (April 8, 2004). "Effects of an inhibitor of cholesteryl ester transfer protein on HDL cholesterol" (abstract). New England Journal of Medicine. 350 (15): 1505–1515. doi:10.1056/NEJMoa031766. PMID 15071125. Retrieved 2006-12-03. ↑ http://clinicaltrials.gov/ct2/show/NCT00137462 Phase III Lipitor Trial To Study The Effect Of Torcetrpib/Atorvastatin To Atorvastatin Alone. ↑ Cutler, D. M. (2007-03-29). "The Demise of the Blockbuster?". The New England Journal of Medicine. Massachusetts Medical Society. 356 (13): 1292–1293. doi:10.1056/NEJMp078020. ISSN 1533-4406. PMID 17392299. Retrieved 2007-04-23. ↑ Damon, David B.; Dugger, Robert W.; Magnus-Aryitey, George; Ruggeri, Roger B.; Wester, Ronald T.; Tu, Meihua; Abramov, Yuriy (2006). "Synthesis of the CETP Inhibitor Torcetrapib: The Resolution Route and Origin of Stereoselectivity in the Iminium Ion Cyclization". Organic Process Research & Development. 10 (3): 464. doi:10.1021/op060014a. ↑ Guinó, Meritxell; Phua, Pim Huat; Caille, Jean-Claude; Hii, King Kuok (Mimi) (2007). "A Concise Asymmetric Synthesis of Torcetrapib". The Journal of Organic Chemistry. 72 (16): 6290. doi:10.1021/jo071031g. PMID 17625891. Medscape / HEARTwire : Torcetrapib Torpedoed: Increased Risk of Mortality, Cardiovascular Events Ends Development.